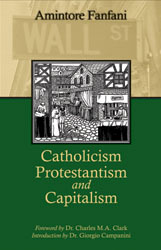 Copies of Catholicism, Protestantism, and Capitalism normally ship within 3 business days. Dr. Charles M. A. Clark is Professor of Economics, Tobin College of Business, and Senior Fellow, Vincentian Center for Church and Society at St. John?s University, New York. He has authored or edited eight books, the most recent of which is The Basic Income Guarantee: Ensuring Progress and Prosperity in the 21st Century (2002). This is the publishing event of the decade. Don't miss it!